All baskets are handcrafted by the Cherokee Indians. They cut their own trees, and make their own dyes from plants and roots. The finished baskets are truly unique and highly collectible. No self respecting country home could possibly be so without a bear or doll here or there ... fact is the more the merrier. A well loved bear reminds us of younger days and is a comforting friend just watching over us. We have lots of different styles to choose from. All are unique collectibles. From Raggedy Ann and Andy to Coca-Cola Bears, you're sure to find something to add to your collection! Go on, pick out a new friend or two, they are cute, cuddly and beyond country. 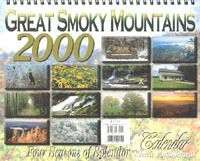 "Once in a Lifetime" Great Smoky Mountains National Park 2000 Calendar. This calendar features 12 magnificent photographs of the Great Smoky Mountains. Each full color image shows off the splendor of the Great Smokies! Take a visual vacation 'cause you really want to be in the Smokies ... the most visited National Park in the world. Be sure and check out our Cabin Rentals for the "bestest" vacation you and Bubba ever had where the Great Smoky Mountains are "your backyard"
These are the most beautiful horses that you have ever seen. They are available in many different styles and colors. You can even order one with a music box that plays your choice of music. More information on these carousel horses. Just like the t-shirts! These items always get a laugh from Bubba and all of his friends! 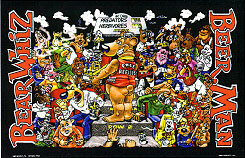 More information on the Bear Whiz Accessories is available here. Thirstystone coasters are made from completely natural sandstone, formed millions of years ago. They are the most absorbent coasters - naturally. Choose from several designs. Available as a set of four. 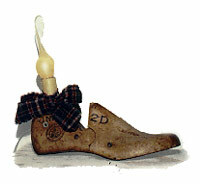 No real or 'wanna be' country home would be complete without a cute little spool or shoe lamp. Includes a very unique flicker bulb, that casts a warm romantic glow. Several styles and sizes available. You can even pick the ribbon color. These bears are as cute as can be. Brought to life by the talented abilities of the artist. Uncle Bubba's is currently featuring the "Ain't Life Sweet" series. There are many different styles to choose from including afgans, wall hangings, calendars, door matts, and pillows. Take a look! Enter Uncle Bubba's Store to order our General Merchandise online.